In this tab you can set the rates that the cost calculation is based on. They are saved in the active document. Currency symbol used when you save the cost statistics. The rate per hour worked is used in cost calculations based on the number of hours worked. In the Translation unit frame, the basic translation unit is set: word or character. In the Source text/translation frame, it is defined whether the cost calculation is based on the source text or on the translation. Nowadays, the cost calculation is usually based on the source text. In the frame, the basic rate per translation unit is set. Depending on the settings in the Translation unit and Source text/translation frames, you can define separate values. 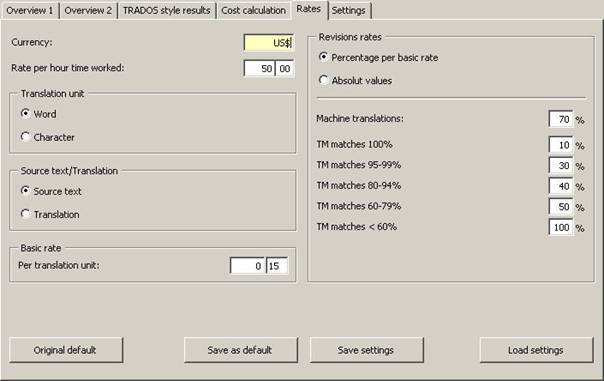 In the Revision rates frame, the rates for revising machine translation results and TM matches are defined. These rates are used for the Work done (weighted, by type) and Work to be done (weighted, by type) calculation types. The two options Percentage per basic rate and Absolute values define whether the revision rates are calculated automatically according to the percentage entered based on the basic rate defined above, or if the revision rates are entered as absolute values. Here, the revision rate for machine translations is set. The rate to be set here can be very different, depending on the quality of the machine translation.